So how big is the problem? 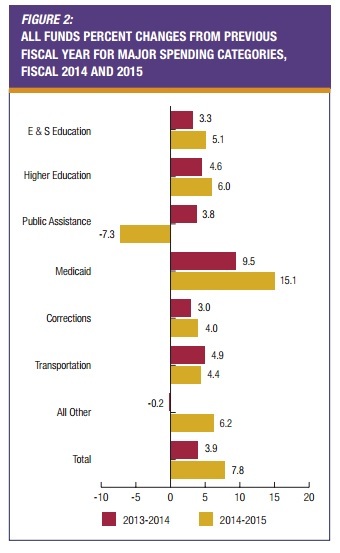 Enormous if you look at the numbers from the National Association of State Budget Officers. States increased their spending in fiscal year 2015 by the biggest margin in more than 20 years, but most of the increase was thanks to huge leaps in Medicaid spending under the first full year of the Affordable Care Act (ACA). Spending increased last fiscal year, which ended on June 30 for most states, by 7.8 percent, according to new estimates from the National Association of State Budget Officers (NASBO). It’s the biggest boost since 1992 and was thanks to a 15.1 percent increase in Medicaid spending, much of that paid for via federal Medicaid funds. Illinois, Michigan, Kentucky, Nevada and Oregon saw more than 30 percent increases in federal funding because they expanded Medicaid under the ACA. But 2015 was also a year where states were putting up more of their own money again. Here’s the chart showing which outlay categories grew the fastest. The article points out that spending is outpacing revenue. On average, state revenues aren’t keeping pace with spending; NASBO estimates General Fund revenues will increase by just 3.8 percent. Though the real problem is that spending is expanding faster than the private sector, which is the opposite of what is called for by my Golden Rule. One of the reasons Medicaid grows so fast is that the program is split between Washington and the states, which both picking up a share of the cost. This may sound reasonable, but it creates a very perverse incentive structure since politicians at both levels can vote to expand the spending burden while only having to provide part of the cost. The National Center for Policy Analysis explains how this system produces bad decisions. Medicaid has a horrible financing mechanism: Federal transfers to states are not based on the number of poor people, or any other reasonable calculation. Instead, they depend on the amount of its own taxpayers’ money a state spends. Traditionally, when California spent $1 on Medi-Cal, the federal government kicked in $1. …So, state politicians hike taxes and spending on their own citizens in order to get as much funding as possible from people in other states (via the feds). Hospitals and Medicaid MCOs maximize this by agreeing to a state tax on themselves, which the state uses to ratchet up the federal funding. After multiplication, the money goes right back to these providers. …Stopping this wild spending growth requires fundamental reform to Medicaid’s financing. Congressional Republicans have proposed “block grants,” whereby states would get federal Medicaid transfers based on their population of poor residents, not how much they gouge out of their own people. But unless that kind of reform happens, the program will continue to grow and become an ever-larger fiscal burden. Heritage Action has more details on the perverse incentives of the current system. …the federal government promises to reimburse states for a majority of their Medicaid spending, most of which involves reimbursements to health care providers. Therefore, states collude with health care providers in the following manner: they tell providers that they will tax them (so-called “provider taxes”), bringing in more revenue to the state. The state then promises to filter that money back to those same providers in the form of higher Medicaid reimbursements. States then bill the federal government for this added cost. Because the federal government provides more than 50% of total Medicaid funding, both state governments and Medicaid providers are made better off by the arrangement, while the federal government is stuck footing a larger bill it had no part in creating. Though I partially disagree with the assertion that the feds are blameless. After all, it was politicians in Washington who created this wretched system, including the reimbursement rules that states manipulate. This info-graphic illustrates how the “provider fee” scam operates. The net result of all this is a nightmare for federal taxpayers, but states also are losing out when you consider the long-run consequences. And that’s even true with the Medicaid expansions contained in Obamacare, which supposedly were going to be financed almost entirely by Uncle Sam. The Wall Street Journal reports. …the Affordable Care Act was designed to essentially bribe states to expand their Medicaid programs: The feds offered to pay 100% of additional costs through 2016, dropping to 90% by 2020. This “free money” prompted 30 states and the District of Columbia to take the deal. Democratic activists have joined with state hospital lobbies to pressure lawmakers in the remaining 20 state capitals to follow. But free money can be very expensive. Consider the experience of the states that did expand Medicaid. “At least 14 states have seen new enrollments exceed their original projections, causing at least seven to increase their cost estimates for 2017,” the Associated Press reported in July. The AP says that California expected 800,000 new enrollees after the state’s 2013 Medicaid expansion, but wound up with 2.3 million. Enrollment outstripped estimates in New Mexico by 44%, Oregon by 73%, and Washington state by more than 100%. This has blown holes in state budgets. Illinois once projected that its Medicaid expansion would cost the state $573 million for 2017 through 2020. Yet 200,000 more people have enrolled than were expected, and the state has increased its estimated cost for covering each. The new price tag? About $2 billion… Enrollment overruns in Kentucky forced officials to more than double the anticipated cost of the state’s Medicaid expansion for 2017, the AP reports, to $74 million from $33 million. That figure could rise to $363 million a year by 2021. In Rhode Island, where one-quarter of the state’s population is now on Medicaid, the program consumes roughly 30% of all state spending, the Providence Journal reports. To plug this growing hole, Rhode Island has levied a 3.5% tax on insurance policies sold through the state’s ObamaCare exchange. Interestingly, Obamacare is causing pro-big government states to dig even deeper fiscal holes. The National Center for Policy Analysis has some remarkable data on this development. States that expanded Medicaid tend to have per capita state spending that’s about 17 percent higher than non-expansion states. …In 2004, expansion states had median per capita tax collections (both state and local) of 19 percent more than non-expansion states. By 2012, this gap had widened with expansion states collecting 28 percent more taxes per capita than non-expansion states. Moreover, since 2008 expansion states have moved to increase taxes, while non-expansion states have reduced taxes slightly. Unsurprisingly, the states that are making government bigger are experiencing slower growth. In 2001 expansion states had real median income that was nearly 13 percent higher than non-expansion states. However, by 2013 this gap had narrowed to just over 9 percent. Expansion states have historically had slightly lower poverty rates, but the difference was only 1 percentage point by 2012 (12.9 percent vs. 13.9 percent). Non-expansion states, although slightly poorer, have lower unemployment than expansion states (6.7 percent versus 7.2 percent). By the way, the decision by some states to reject Medicaid expansion is a huge – and underappreciated – victory over Obamacare. Another point worth mentioning is that the program isn’t even a good deal for the poor according to Scott Atlas at the Hoover Institution. Here’s some of what he wrote for the Wall Street Journal. Americans should be more worried than ever about Medicaid… The cost of the $500 billion program is expected to rise to $890 billion by 2024… Yet more spending doesn’t necessarily mean better care for beneficiaries… The expansion of Medicaid is one of the most misguided parts of ObamaCare… Some 55% of doctors in major metropolitan areas refuse to take new Medicaid patients… Medicaid enrollees who manage to see a doctor typically experience outcomes worse than those under private insurance. That means more in-hospital deaths, more complications from surgery, worse posttreatment survival rates, and longer hospital stays than similar patients with private insurance. A randomized study by the Oregon Health Study Group showed that having Medicaid did not significantly improve patients’ physical health compared with those without insurance. The proverbial icing on this foul-tasting cake is the way the program enables staggering amounts of fraud and theft. I’ve written about this before (including how foreigners are bilking the system). But here are some fresh details from the Wall Street Journal. …one of our favorite political euphemisms is “improper payments.” That’s how Washington airbrushes away the taxpayer money that flows each year to someone who is not eligible, or to the right beneficiary in the wrong amount, or that disappears to fraud or federal accounting ineptitude. Now thanks to ObamaCare, improper payments are soaring. Last week the Health and Human Services Department published an “alert” warning that the improper payment rate for Medicaid in 2016 will likely hit 11.5%. That’s nearly double the 5.8% rate as recently as 2013… The 11.5% for 2016 is likely an underestimate given that HHS’s goal last year was 6.7% and instead scored 9.8%, which amounts to $29.1 billion. The dollar amount of improper payments in Medicaid was bound to rise because ObamaCare vastly opened eligibility. In 2015 enrollment climbed by 13.8% and one of five Americans are now covered by the program. …In recent audits of Medicaid in Arizona, Florida, Michigan and New Jersey, the GAO uncovered 50 dead people who recouped at least $9.6 million in benefits after they died; 47 providers who registered foreign addresses as their location of service in places such as Saudi Arabia; and $448 million bestowed on 199,000 beneficiaries with fake Social Security numbers—12,500 of which had never been issued by the Social Security Administration. But as bad as all this sounds, it can get worse. If HHS tries hard enough, maybe the department can match the failure rate for school lunches (15.7%) or the Earned Income Tax Credit (23.8%). And Kevin Williamson of National Review adds some acidic observations. …the criminal — and I do not use the word figuratively — administration of Medicaid by the Obama administration. …improper payments under Medicaid have become so common that they will account this year for almost 12 percent of total Medicaid spending — just shy of $140 billion. …That rate has doubled in only a few years…12 percent in improper payments isn’t an error rate — it’s a malfeasance rate. …If improper and illegal federal payments were an economy of their own, that economy would be bigger than Hungary’s… The Obama administration is not lifting a pinky to do anything about this, even though analysts such as John Hood have — for years — been arguing that it is necessary and possible to reform this mess. As the Wall Street Journal has reported, we don’t even verify that doctors billing Medicaid for services rendered are actually doctors. In many cases, we do not do much to verify that their patients actually, you know, exist. We’ve paid untold billions of dollars to “clinics” that turn out to be little more — or nothing more — than post-office boxes and prepaid cell phones. And as bad as that 12 percent rate is, some policy scholars believe that it is in fact probably worse. Kevin observes that this system is good for the Poverty Pimps. …the real problem with the welfare state is not the poor people receiving checks — it’s everybody in the middle, the vast array of government employees, their union allies, contractors, and third parties who earn six-, seven-, eight-, or nine-figure paydays taking their cuts of money we think we’re spending on the poor. This is an enormous criminal conspiracy against the American people and the public fisc. You might think that fixing this fraud would be an area for bipartisan cooperation. But the sad reality is that fraud is a feature, not a bug. Politicians like the fact that scam artists in their states and district are stealing healthcare money from taxpayers. After all, recipients of the loot can be registered voters and campaign contributors. So what’s the best way of fixing this mess? Will big tax hikes solve the problems? If the problem is that America isn’t enough like France, then the answer is yes. But if the problem is that government already is too much of a burden and that it would be a good idea to at least slow down the rate at which America becomes France, then the answer is genuine entitlement reform. And this video shows how the Medicaid program should be “block-granted” (just as welfare was reformed in the 1990s). P.S. For all intents and purposes, block granting Medicaid is a partial repeal of Obamacare. Just in case you wanted an additional reason to support reform. NedlandP, Medicaid, as well-intentioned as it may be, encourages people to keep being dependent upon government. Your recommendation for reforming Medicare is to provide vouchers so Medicare recipients can purchase services in the “free” market. Given that the average Medicare recipient costs $14,000 per year, and elderly couple would have $28,000 to pay for coverage. The problem is that they would not be paying with their own money. Vouchers give no incentive to buy efficiently. Our entire safety-net has ignored incentives. A UBI that segregated a portion for healthcare gets us on the road to universal free market care. Obviously provision must be made to cover those with pre-existing conditions, since insurance must reflect individual risk. However, as universal free market healthcare takes hold the cost of pre-existing conditions disappears. Medicare support could be funneled through a demogrant based on age for the amounts required over the healthcare provision of the UBI. Fortunately Virginia has been on the right side of this issue. Unfortunately, most people now believe federal dollars are free money. Our education system as well as the media has failed to educate the populace on the facts. Why are Medicare or Social Security the bogey man? Disband the Education Department, the IRS and half of the minions ‘working’ for Congress and the Executive Branch.